In medieval times, grave looters and thieves would cover themselves in an herbal oil blend to prevent themselves from getting sick with the plague. This blend has been passed down through generations to increase immunity function in the body. The formula is known as thieves oil due to it’s origin. Thieves is still used today to help boost your immunity, and recommended by many aromatherapists. Many people report seeing improvements staying well, avoiding seasonal viruses. Making your own thieves is simple and inexpensive. Don’t get caught up in a multi-level marketing scam paying extra for an oil formula made for you. For the cost of one bottle of thieves, you could make many formulas yourself. I really like Aura Cacia and Now brands. Store your oil in an amber bottle to keep it safe from UV light. 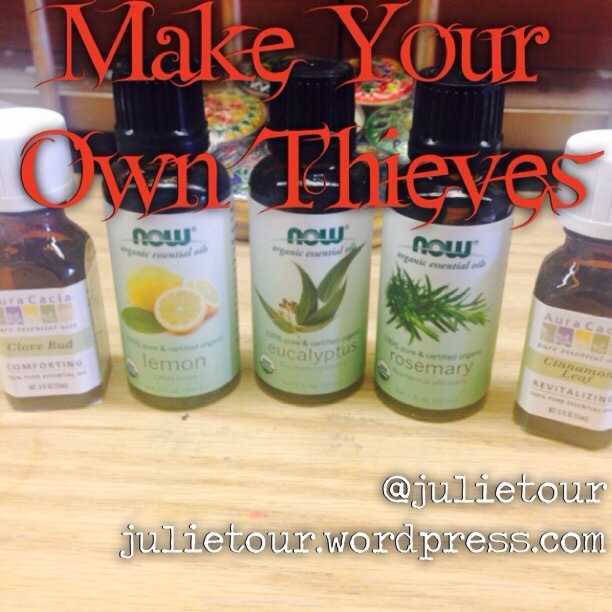 Thieves, like any essential oils, should not be ingested.